The new North Queensland Livestock Recovery Agency has been established to come up with new funding programs to help with restocking herds and rebuilding farm infrastructure devastating north Queensland floods killed hundreds of thousands of cattle. Prime Minister Scott Morrison says every farmer needs a specific type of assistance. “I met families who had been on the land for generations building their herd,” he said. 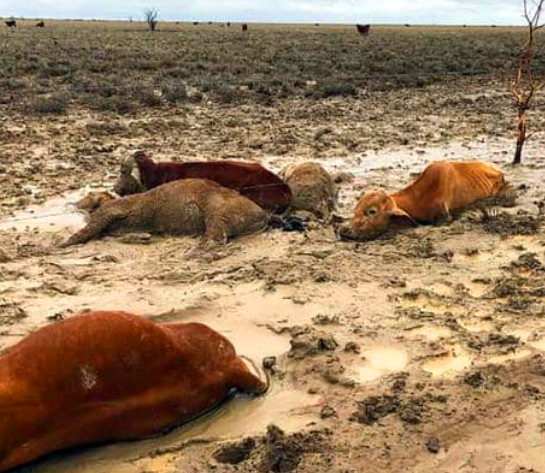 “To see them washed away, lying in the dry mud, it's just heartbreaking. Up to half a million cattle froze or drowned in the flood, or were so injured they had to be put down. “The water is still draining and when I was up there a little while ago stock was still dying with pneumonia,” Mr Morrison said. Former Northern Territory chief minister Shane Stone QC will lead the new agency, which will also include an advisory board with representatives from the northern cattle industry and local councils. It will advise the Federal Government on how existing and new Commonwealth policies can help rebuild the industry. Other changes should help too, such as the opening of the regional investment corporation to develop concessional loans for farmers. This measure is intended to enable farmers to refinance existing debt, and also offer access to loans for restocking by using stock as collateral. The Commonwealth has also written to companies that lend to flood-affected farmers to ask them not to foreclose or force the sale of farms, and defer interest and principal payments for three years, if possible. Additional assistance for small businesses and not-for-profits has been provided in the form of special recovery grants of $50,000 on offer to help businesses rebuild, repair and replace stock, plant and equipment. The government is also offering a Medicare rebate to fund video conferencing between medical GPs and people in flood-affected areas.